NOTE: Delivery rates differ for non-mainland UK addresses; Please check our delivery details page and/or contact us before placing an order. DELIVERY NOTES: Please note that standard delivery is only to mainland England, Wales and parts of Scotland. For delivery to the Highland and Islands of Scotland, Northern Ireland, Isle of Man and Isles of Scilly please contact us as there are surcharges for these delivery locations. Delivery to surcharge locations can take 3-5 working days. The courier will only deliver to the front door of the main building. They will not take goods upstairs or into lifts. * All items are dispatched with a 24 hour delivery service and are usually delivered next day, however, there can be exceptions where parcels are delayed. Next day delivery is for working business days Monday to Friday. The Savannah modular rattan sofa set is one of the most versatile and complete outdoor furniture solutions available. Made of beautifully contrasting light and dark brown rattan weave and aluminium feet, this set can be arranged in a variety of combinations to suite your outdoor space. The set comes complete with luxury padded shower proof seat and back cushions and the cushion covers are removable for machine washing. The set features a 2 in 1 coffee table / ottoman. Simply place the 5mm tempered glass on top when you need a coffee table or add the luxury padded cushion when you need extra seating or a footstool! Your garden seating arrangment just wouldn’t be complete without a parasol to provide cooling shade on those extremely hot days. The Savannah modular sofa set comes with a free standing 3m light beige parasol with wind-up ‘crank’ mechanism for easy use. The parasol fits perfectly behind the sofa to create a cooling canopy. When its not needed simply wind the crank handle to fold the parasol neatly away. The polyethylene (PE) rattan and aluminium frame are weather proof, making the set resistant against water, acid rain, salt water and soaps. Its important to note that this is not the cheaper PVC rattan. The rattan weave is fully SGS tested and resistant to UV light and can structurally withstand temperatures as low as -15ºc and as high as 60ºc. A damp cloth is all thats needed to maintain this furniture. This is not the cheaper flat pack rattan furniture. The Savannah sofa set comes ready built. Solar Mosaic Light: Adpot the high-quality solar panel, get fully charged about 8 hours, light up 8 hours at night. Beautiful Mosaic Craft : It’s made of the crystal glass and high efficient solar panel. All the glass fragments are posted by hand. Absolutely the perfect gifts. 2 Modes- Single White color/ Color Changing:Color changing: Please kindly push the button at “Color” position, then it will show gradual color-changing in RGB. Single Mode: Please kindly push the button at ” Single” position, then it will show bright white light. Waterproof : This solar powered white mosaic glass ball is fully water proof and also weatherproof. It will function even in the rainy days and will offer what it is made for in the first place. The package includes : A white shattered mosaic design glass ball and the actual solar panel integrated machine. The total size of the mosaic ball is 5.12inch in diameter and 4.13inch in height. LED: 1PC white LED, 1PC RGB LED. 1.Environmental protection and save energy. 2.Adopt the most advanced solar energy,durable and a long lifetime. 3.Give off soft and gentle light,makes your eyes feel very comfortable. 4.You can put it on your desk,bedroom,balcony and so on. 5.Built in 1.2V/600mAh NI-MH rechargeable battery. 6.Also be used for brush pot,very convenient. 7.Adopt the high quality solar panel,get fully charged about 8 hours. 1.Turn the button at “Color” position, then it will appear gradual color-changing(red,green ,blue) circulation in RGB. 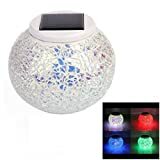 3.When turn on the solar table lamp,the light on or off,depend on the light reaction,only put it to a dim place or cover the solar panel with hands,the lamp will bright up.